This case involved a driver Mr H and 2 passengers visiting a friend and parking in a residential private car park at night. The friend couldn't find his visitors permit but gave consent to park and placed a Housing Association calling card in the car window. Mr H and his passengers left later that night. Fast forward several months and Mr H received a Notice to Keeper from Armtrac Security Services stating that as they had not heard from him, his chance to appeal had passed and £100 was now due. This was the first time that Mr H was aware of any parking ticket. At this point the Mr H sought forum help. 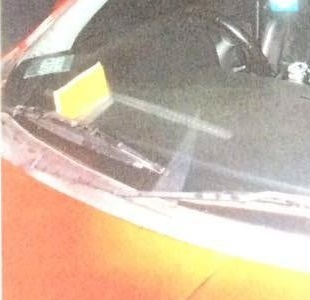 A closer look was taken at the photos supplied by Armtrac and it was observed that the ticket wasn't stuck to the car windscreen, but stuck under the wiper. There is a practice carried out by the more disreputable operators of placing tickets on a car, taking photos and then removing the ticket. This is known as 'Ghost Ticketing'. The first thing a registered keeper knows about this is when they receive a Notice to Keeper demanding £100. The registered keeper is informed that the opportunity to appeal the charge has passed. Disreputable operators like this practice because it increases their charge from £60 to £100, it removes the right to appeal and it is difficult to prove. However the fact that the ticket wasn't stuck on the car is strong evidence that this practice had occurred. The next opportunity the registered keeper had to challenge the ticket was in court and Amtrac and their solicitors Gladstones duly obliged by issuing a Letter before Claim. A visit was made to the car park at night and photographic evidence was taken of a dark unlit car park, an entrance with no signage whatsoever and the first signage seen was displaying the logo of the British Parking Association which Armtrac had left a year previously. There was also a sign stating that wheel clamping was in operation. Armtrac were investigated by the British Parking Association and told to remove the signs. The claim rumbled on and a date was set for 23 January 2017. In the interim Mr H did not receive any of the information that he requested regarding the case. This is standard practice by Gladstones. Not providing information means they can keep their costs down and it also makes it much more difficult for any defendant to know what they are being sued for, thus meaning they cannot defend the case properly. Armtrac also claimed they hadn't been investigated by the British Parking Association. Armtrac's witness statement 'put together' by Mick Cooke, Armtrac's manager was received late by the court and Mr H. The witness statement was a template often used by Gladstones and is amusing only to show the levels of incompetence which can be reached by Gladstones in a simple document. Mr H was approached by Armtrac's advocate but Mr H didn't want to speak to him about the case. The advocate found rather rude but Mr H wanted to speak to him only in the court room, as is his right. When they entered the chambers the judge launched straight into a tirade against the hapless solicitor about the quality of the witness statement which left the solicitor stuttering . The judge was not impressed that Mick Cook hadn't bothered to turn up, nor was he impressed that the notice to keeper was missing from the witness statement. All this time Mr H hadn't said a word and due to the legal jargon being used did not understand all the finer points of law that were being discussed. The judge continued taking apart the witness statement and scolding the solicitor, sometimes stopping to mutter under his breath. He clearly wasn't happy with what had been put in front of him. It all ended with the judge stating 'You don't have a case so I'm going to have to dismiss this and with that he began to close his files. It was at this point that Mr H piped up to say 'What about my expenses? The judge turned to the solicitor. 'Yes, what about his expenses?' There was some negotiation about costs and the solicitor argued that 5 hours at £19/hr was excessive but offered £8/hr. The judge asked if Mr H was happy with this, which he was so costs of £48 including travel, printing and 'refreshments' is due within 30 days. Mr H and the solicitor had a brief conversation outside. He said that he had been employed directly by Mick Cook and not Gladstones. The solicitor left and Mr H popped into the nearest pub for some 'refreshments' courtesy of Mr Cook of Armtrac. Mick Cook from Armtrac made the following statements which he claimed were true on his witness statement. Although the witness statement was a 'Gladstone's special', Mick Cook still signed it and is therefore responsible for its contents. He stated that Mr H claimed not to be the driver and that he had been invited on numerous occasions to identify the driver but failed - This was untrue. Mr H had said he was the driver from the outset. He stated that as Mr H was being pursued under the Protection of Freedoms Act 2012 which states 'The creditor has the right to recover any unpaid charges from the keeper of the vehicle'. However, as he did not comply complying with all the requirements of the Protection of Freedoms Act 2012 he could not pursue Mr H as the registered keeper. He stated that the criminal case of Elliot v Loake was applicable. This case has no place in small claims courts, and has been laughed out of court by judges many times. He stated that Mr H had failed to nominate the driver as required by the Protection of Freedoms Act 2012, The Act requires nothing of the sort. And of course, he had declared he was the driver. He stated that the Protection of Freedoms Act 2012 presumes the registered keeper to be the driver unless proved to the contrary. This is incorrect. He stated it didnt matter that a ticket was not left on the car as Mr H entered into a contract with Armtrac when parking. Obviously not being able to appeal or pay at a lower charge is irrelevant to Mick Cook as it is detrimental to hs business model. In any event, not leaving a ticket means that keeper liability does not exist. Witness statements were supplied confirming that no ticket was found on the windscreen. He stated that Parking Eye v Beavis  UKSC 67 is relevant even though the signage fails under Beavis. He claimed that the signs were clear and unambiguous even though they were dark and unlit and in any case display logos from different trade organisations and advertise that clamping is in operation. The signage filed as evidence on the witness statement was different to the actual signage on site. 'We issue on a vast majority of claims, majority of which are not defended and therefore it is time consuming and not financially viable to send further particulars of claim'. He stated that he denies the contract constitutes 'a distance contract' with in the meaning of the Consumer Contracts Information Cancellation and Additional Charges Regulations 2013 because Mr H had parked on the land for the purpose of his trade, business, craft or profession. This is untrue, Mr H was on a social visit. (The Prankster fell about laughing when he read this. However, it has to be remembered that Gladstones in the past have argued that the telephone is not a method of distance communication). He stated that he is claiming damages of £50 as is his right in addition to the parking charge incurred. This is completely false. Also contained within the witness statement was a contract that stated Armtrac can only pursue for trespass and to recover any monies due to the landowner. In cases of trespass only the landowner can make a claim not Armtrac. He stated that ParkingEye v Beavis justifies the charge of £100. However, Beavis makes it clear that a charge for trespass cannot possibly be viable, as in a trespass case only actual costs incurred or a nominal £1 can be sought. As Gladstones have now lost a huge number of cases on this point, it is surprising they do not know this. In one of their cases, Homeguard v Jopson, HHJ Charles Harris QC explained that Beavis did not apply in residential cases and awarded £2000 in costs under the unreasonableness clause (27.14(2)g) against Homeguard. As there was no case to answer for against Mr H is now considering pursuing Armtrac for a Data Protection Breach as his personal data was misused by Armtrac. Mr H would seem to have a viable claim against both Armtrac and the landowner for a data protection breach due to misuse of personal data. Normally a claim of £250 might be seen to be appropriate. However, due to MIck Cook's behaviour, a larger claim may well be appropriate. The bin man has his own fingers broken. What a total incompetent! I only regret that Mr H missed the opportunity to ask Armtrac's representative what his hourly rate was (and I doubt it's £8, or £19). Given that Mr H did a better job of preparing his case, I'd suggest that his time is worth more. the rate is FIXED at 19. The hearing was in open court, not chambers.